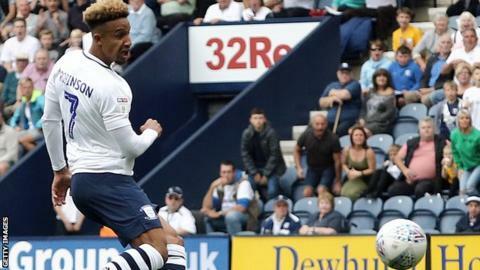 Bolton Wanderers came from two goals down to rescue a draw away to Preston North End in the Championship in an eventful Lancashire derby. Forward Callum Robinson opened the scoring for Alex Neil's side after rounding Bolton goalkeeper Ben Alnwick, before Alan Browne's stunning volley doubled the hosts' lead. But just before half-time Sammy Ameobi halved the deficit and moments later Pawel Olkowski equalised for the away side, smashing the ball in off the underside of the bar. After the full-time whistle Preston's Ben Pearson was given a straight red card for his part in a clash with Bolton's Joe Williams, who was cautioned. Phil Parkinson's Bolton had started the day in third place and were looking to bounce back from their first league defeat of the season against Sheffield United last Saturday. But Preston could have been out of sight after 33 minutes when forward Graham Burke dragged his first time shot narrowly wide with the score already at 2-0. Bolton had the pick of the chances in the second half with Jason Lowe and Craig Noone coming close for the visitors as the Lilywhites held on for a point. The draw means Preston rise to 18th in the table, while the Trotters fall to sixth. "From our point of view it's frustrating. When you are 2-0 up at home you would expect to go on and win the game. "I feel that my changes made an impact in that they made us resolute and tighter but I don't think we really had too much of an attacking threat in the second half. "The difficulty I have at the moment is finding the balance between our attacking threat and also being defensively solid. We have scored against Stoke then scored against Bolton but then we've conceded against both." "We showed character today, real character. We've seen a terrific and spirited performance. All over the pitch I was pleased with our spirit and determination, but also the quality on the ball, particularly in midfield. "I think the squad is stronger this year, we've got more players with Championship experience. "We are pleased with the points return so far and, when you lose your unbeaten run, as we did against Sheffield United last weekend, it's important that we responded in the right way." Match ends, Preston North End 2, Bolton Wanderers 2. Ben Pearson (Preston North End) is shown the red card for violent conduct. Second Half ends, Preston North End 2, Bolton Wanderers 2. Delay in match Craig Noone (Bolton Wanderers) because of an injury. Attempt missed. Callum Robinson (Preston North End) right footed shot from outside the box is close, but misses to the left. Assisted by Ben Pearson. Corner, Preston North End. Conceded by Mark Beevers. Corner, Preston North End. Conceded by Pawel Olkowski. Delay in match Pawel Olkowski (Bolton Wanderers) because of an injury. Daniel Johnson (Preston North End) is shown the yellow card for a bad foul. Pawel Olkowski (Bolton Wanderers) wins a free kick in the attacking half. Foul by Louis Moult (Preston North End). Pawel Olkowski (Bolton Wanderers) wins a free kick in the defensive half. Attempt saved. Callum Robinson (Preston North End) right footed shot from outside the box is saved in the bottom left corner. Assisted by Tom Barkhuizen. Offside, Bolton Wanderers. Gary O'Neil tries a through ball, but Craig Noone is caught offside. Substitution, Bolton Wanderers. Jonathan Grounds replaces Andrew Taylor because of an injury. Delay in match Andrew Taylor (Bolton Wanderers) because of an injury. Corner, Preston North End. Conceded by Ben Alnwick. Attempt saved. Callum Robinson (Preston North End) left footed shot from a difficult angle on the left is saved in the centre of the goal. Assisted by Louis Moult. Attempt saved. Craig Noone (Bolton Wanderers) left footed shot from a difficult angle on the left is saved in the top left corner. Assisted by Pawel Olkowski. Andrew Hughes (Preston North End) wins a free kick in the defensive half. Attempt saved. Andrew Taylor (Bolton Wanderers) left footed shot from the centre of the box is saved in the top left corner. Assisted by Sammy Ameobi. Attempt blocked. Gary O'Neil (Bolton Wanderers) right footed shot from the right side of the box is blocked. Attempt missed. Sammy Ameobi (Bolton Wanderers) left footed shot from outside the box is close, but misses to the right. Assisted by Jason Lowe following a set piece situation. Craig Noone (Bolton Wanderers) wins a free kick on the right wing.